The 2018 Governor's Challenge closed with a thrilling Day 4. Osbourn Park (Va.) 2020 guard Ethan Wilson. 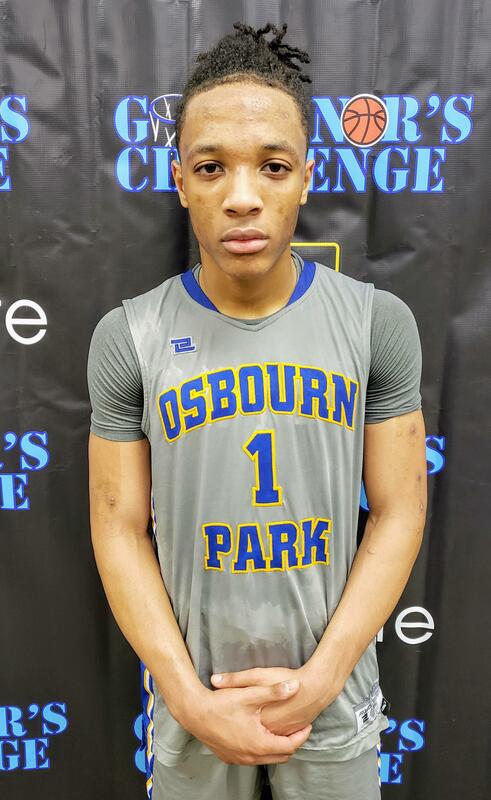 SALISBURY, MD - The buckets were piling up at a furious pace for Osbourn Park (Va.) 2020 guard Ethan Wilson on Saturday, and the only reprieve his defenders got was when he briefly left the court to get a cut bandaged on his shooting hand. Even that didn’t come close to stopping him, as Wilson nearly made Governor’s Challenge history, falling just two points short of breaking the event record for points in a game in a 43-point performance against Hereford (Md.) at the Wicomico Youth & Civic Center. Former Harford Christian (Md.) guard Derreck Orr set the record with 44 last December. The 71-37 win gave The Yellow Jackets the Bracket 16 title, as Wilson finished 13-of-26 from the field - including 5-of-11 from 3-point range - and 12-of-16 from the free throw line. The performance capped a stellar two-day performance for Wilson, who had 33 points in a 69-45 win over Pocomoke (Md.) on Friday. His 76 total points is believed to be the highest two-day total in event history. The 6-foot, 150-pound Wilson outscored Hereford by himself in the first half, tallying 25 points as the Yellow Jackets built a 38-16 halftime lead. Wilson had 34 points after three quarters, but said he wasn’t aware of how close he was to the record until a teammate told him around point 38. He made a late run, but ultimately fell just one short. The Yellow Jackets - who won just four games a year ago - look to be on the right track under first-year Coach Jeremy Coleman, who had previously attended the Governor’s Challenge as an assistant at Battlefield (Va.). When Mike Bozeman took over the Riverdale Baptist girls’ basketball program in 2017, he wanted to take his four years of experience at the helm of George Washington women’s basketball to the historic Prince George’s County program. Over the past week-and-a-half, the Lady Crusaders have played eight games in 11 days, in three different states, on two different coasts. The grueling swing ended Saturday night at the Governor’s Challenge, a 67-37 romp over St. Andrew’s from Rhode Island, one day after Bozeman’s team competed in three straight games in the Raleigh-based John Wall Invitational. From Dec. 19 through 22, Riverdale Baptist participated in the Phoenix-located Nike Tournament of Champions. They’ve only had two days to rest on this whirlwind journey. The Lady Crusaders started flat Friday against St. Andrew’s, perhaps because of the road trip grind, shooting below 30 percent in the first three quarters, but labored away to explode for 30 points in the fourth quarter. 2019 forward Rayne Tucker, a James Madison University commit, noticed the fatigue within herself and her team well before Saturday night’s 8:30 p.m. tipoff. But the senior and recent Good Counsel transfer saw an opportunity to become more of the leader Bozeman wants her to be. She finished with a game-high 14 points on 6 of 11 shooting to along with seven rebounds, five steals, and three blocks in 18 minutes of action. “Her effort is what spurred us, what kept the team going,” Bozeman said. Judging the opening four minutes of regulation, it appeared the Lady Crusaders would have their way with the Rhode Island school. They built a 9-3 lead after 2019 guard Kaylah Ivey (12 points) drilled a 3-pointer on the right wing. But empty possessions mounted, allowing St. Andrew’s to whittle away and make it 15-13 through one quarter. Despite a 27.3 percent mark from the field (9 of 33) and seven missed free throws (14 attempts), the Lady Crusaders maintained a 27-17 lead at the half thanks to their defensive effort. St. Andrew’s converted just 25.9 percent of its first-half shots (7 of 27), including 1 of 7 triples. For the game, the Saints shot 27.7 percent (13 of 47). At the end of the third quarter, St Andrew’s remained around, trailing 37-26. But shortly after, the Lady Crusaders turned up the heat with their vaunted full court press (21 forced turnovers) and closed the game on a 17-2 run. “This last week has been a grind for us, so I’m really proud of how they responded after halftime,” said Bozeman, whose team improves to 12-3 heading into the new calendar year. All three of those losses have come on this demanding road swing, but the Lady Crusaders remain nationally ranked: No. 18 by MaxPreps and No. 19 by espnW. Earlier in the season they toppled nationally-ranked programs Southeast Raleigh and Australia’s Victoria Country. “Everywhere we go we’re going to have a target on our back, so we need to be ready every night,” said Bozeman, who is anticipating another appearance at the Governor’s Challenge in 2019. Winston Churchill (Md.) had just taken the lead with 30 seconds left in regulation but 2019 guard John Mbeng was worried. On the other end of the floor, Hammond (Md.) 2019 guard Jaylen Wiggins freed himself on the wing and no Churchill defender was near. Wiggins eventually got the ball and buried the 3-pointer, doing exactly what Mbeng feared as the Golden Bears went ahead by one with nine seconds left. There was no time, Mbeng thought, to counter with a good look for the win. But Churchill 2019 guard TJ Richardson pushed the ball up the floor one last time, Mbeng trailing, and hurried a pass to 2019 forward David Orta, who was cutting toward the basket. Orta finished at the rim, right before the buzzer, to prevail Churchill over Hammond in thrilling fashion, 65-64. The lead changed hands three times in the final 30 seconds, with 2020 forward Ethan Rinder finishing a layup off the break to put Churchill ahead, 63-61. That’s when, on the ensuing possession, Wiggins (21 points) banged home his fifth triple of the contest to thrust the Golden Bears ahead, 64-63, with nine seconds left. Orta then finished the game-winning layup at the rim off two quick passes to prevail the Bulldogs. No team led by more than five points and, as the game wore on, had the makings for a finish at the buzzer. “After the first half, I thought we would pull away, but once the game kept going, once we got in the bonus, I knew it was going to be wire-to-wire and maybe come down to the buzzer,” Mbeng said. The Patriot High School program has only been in existence since 2011, but it has made tremendous strides recently under third-year coach Sherman Rivers. On Saturday, the Pioneers capped a successful first trip to the Governor’s Challenge with a signature victory, downing Washington Catholic Athletic Conference member Good Counsel (Md.) 58-50 to capture the Bracket 15 Championship at the WY&CC. Patriot - which beat Theodore Roosevelt (DC) 88-65 on Friday - improved to 10-0 on the season. 2019 guards Hagen Vandiver (17 points), Devon Parrish (16) and 2019 forward Jakai Moore (14) led the way for Patriot. Moore - a South Carolina offensive line commit - was a physical presence for the Pioneers on both ends of the floor. The Pioneers jumped out on the Falcons quickly, and led 16-2 after one quarter and 32-17 at the half. The Falcons didn’t go away, eventually whittling the deficit to 54-50 with 1:16 remaining. Patriot handled Good Counsel’s defensive pressure, though, and extended their lead at the foul line to seal the win. For most teams that take part in the Governor’s Challenge, the trip is a chance to bond and test themselves against unfamiliar competition. For Virginia public school teams, though, it offers a chance to use a shot clock, which the Virginia High School League has not implemented. Currently, Washington DC and eight states - California, Maryland, Massachusetts, New York, North Dakota, Rhode Island, South Dakota and Washington - use shot clocks for their public school games. DC began using it 2014, and Maryland in 2017, leaving Virginia as the DMV’s lone holdout. Players from several Virginia teams said they enjoyed using the clock as well, adding that any adjustments were minor. Patriot 2019 guard Devon Parrish agreed. In Maryland, cost was one of the primary reasons previously given for not installing the shot clock. Honore said Virginia may have similar concerns, but thinks it is overblown. Patriot coach Sherman Rivers said he thinks tradition - and old-fashioned thinking - may be another root cause for Virginia’s delay in implementing the change. For now, though, the Governor’s Challenge is one of few ways Virginia public school teams can get a taste of the version of the game their DMV neighbors all currently enjoy. Louis Tang came to America two years ago, ranked as the No. 1 player his age in Taiwan. Before he could make an impact on the court though, he had some other work to put in. The 6-foot-5 Tang has adjusted well off the court, and showed Saturday that he’s just fine on it as well. The St. Mary’s Ryken (Md.) 2019 guard went for 33 points on 12-of-16 shooting - including 3-of-4 from 3-point range - to lead the Knights to an 85-65 win over Gaithersburg in the Bracket 17 Championship at the WY&CC. On Saturday, Tang found himself matched up with Gaithersburg star sophomore guard Jao Ituka, who attacked the rim relentlessly and finished with 28 points. That approach has served Tang well during his transition to life in America both on and away from the court, said Ryken coach Walter Booth, who added that Tang has worked hard since Day 1. “He’s always been super coachable and done whatever I’ve asked,” Booth said. “Just watching his confidence and maturation over the two years has been super impressive, because he’s really worked himself into a Division I player. Last year he looked good in workouts, but when the games [came] and the bullets started flying, he was kind of lost at times and stuff like that. But you just watch him now and he’s playing with so much more aggressiveness and assertiveness, and now he’s become a leader. Tang has already mapped out much of his future, committing earlier this year to play at Virginia Military Institute. What drew Tang to VMI? Theodore Roosevelt (DC) 2019 guard Mickco Reeves opened the day with 30 points on 11-of-17 shooting in a 65-49 consolation win over Easton (Md.) … Kent County (Md.) needed every one of 2020 guard JayShaun Freeman’s 37 points to counter a 36-point, 14-rebound performance by Carver E&S (Pa.) 2019 forward Steven Dao. KCHS won 70-69 in a Bracket 11 consolation game at JM Bennett High School. … 2019 guard and Mississippi State commit Iverson Molinar scored 33 points as Veritas Prep (CA) closed its inaugural Governor’s Challenge trip with a 77-67 win over Virginia Academy at UMES. Veritas won the final three of its four games. … Yale-bound Maret (DC) 2019 forward EJ Jarvis scored 30 points and grabbed 16 rebounds to lead the Frogs to a victory over Boys Latin, Maret outscored The Lakers 18-2 in the fourth quarter to break open a tie game. … Boonsboro (Md.) 2019 guard Kaitlyn Rogers (19 points) outscored Indian River by herself to lead the Warriors to the Bracket 4 championship with a 39-12 win.